The North Canterbury Food & Wine Trail showcases North Canterbury’s local flavours - fantastic food, Canterbury wine, authentic food and wine itineraries and passionate people. ​Discover fresh seasonal produce, savour wine tasting and wine tours, enjoy cafe or restaurant dining, relax in idyllic rural accommodation and experience an easy pace of life just twenty minutes north of Christchurch. 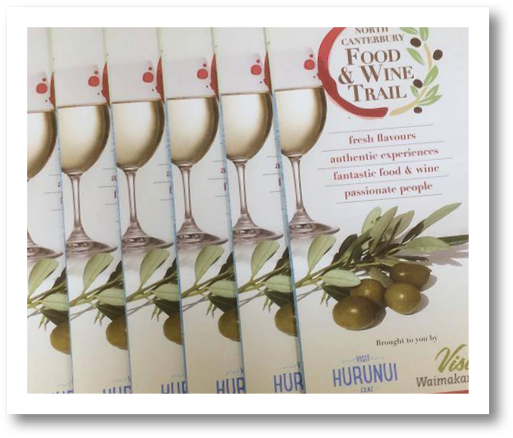 The North Canterbury Food & Wine Trail encapsulates the world famous wine region of Waipara, as well as Rangiora, Oxford, Pegasus, Amberley and Hanmer Springs. ​North Canterbury Food & Wine Trail?